Pogba's resurgence under Solskjaer has been well documented and his performance at Craven Cottage epitomised the way he has played under the Norwegian. Two more goals took his season's tally to 13 - seven of them have been scored in nine Premier League games under Solskjaer - and he completely ran the game for Manchester United. With just 13 minutes on the clock, he latched onto Martial's through ball and from a tight angle smashed the ball high into the top corner of Sergio Rico's net. Claudio Ranieri's side have now lost five of their last six games and a return to the Championship looks all the more likely after this display. Indeed, Mitrovic's twisting header on 72 minutes was the only time they tested United keeper David de Gea in the second half. Shouts of 'You don't know what you're doing' from his own fans when he withdrew Schurrle early in the second half will not help their cause. Solskjaer seemed to have one eye on Tuesday's Champions League match and made six changes to the side that won last time out at Leicester. Martial in particular was in dynamic form, tormenting Fulham's stand-in right back Denis Odoi throughout and scoring a marvellous goal after a run from inside his own half. I tried to give my players more opportunities by playing with two strikers and Ryan Babel in behind. We didn't create anything very dangerous and the penalty finished the match. On Andre Schurrle's substitution: I know the fans were not happy but I had two players with flu in the week, including Andre Schurrle. I can understand the fans always want their players to play but it's not always possible. We will work to try and win our next two games. We're always positive. The players have some fantastic qualities. I've supported United for many years and as a United fan you go into every game thinking you're going to win it. We're on a great run but I think the players are feeling the same. We want to keep moving forward and hang onto this fourth place. When you win games, you're always happy and I think the crowd will enjoy the trip home. Manchester United midfielder Paul Pogba: We've played better but getting two quick goals in the first half changed the game. Ole helps every player play at their best. Ole is himself. He's not acting and he's given joy and confidence to everyone. There is a long way to go with big games coming up. We've got to focus on PSG and try and get points from the big teams. Fulham have conceded 58 goals in 26 Premier League games this season; only three sides have shipped more at this stage in the history of the competition (Barnsley in 97/98 - 62, Swindon in 93/94 - 60 and Blackburn in 11/12 - 59). Claudio Ranieri was frustrated after watching Fulham get punished by Manchester United in Saturday’s early kick-off. The Whites started in a positive fashion and could have gone in front, but Ole Gunnar Solskjaer’s men responded clinically and claimed a comfortable win through Paul Pogba’s brace and Anthony Martial’s solo effort. “We started very well,” Ranieri said. “We created two great chances to score a goal. But suddenly Pogba scored the first goal. “I wanted us to stay calm and then we could still get the opportunity to play and find the solution to draw the match, but my players were very, not anxious, but they wanted to score immediately to draw the match. “But against big teams it’s difficult, and we conceded on the counter attack. And at that point it is more difficult because Manchester has champions in the squad, they slowed down the tempo, kept possession of the ball. In his pre-match press duties, Ranieri called on his players to be soldiers, and he believes their desire to keep attacking until the final whistle demonstrated their fighting spirit. “I have soldiers, because until the end we wanted to score the goal,” he stated. “Even at 3-0 we wanted to score the goals. “When you play against champions you have to stay calm, don’t lose your composure. That’s the real problem. They willed to do something, but you have to stay calm and think. “I understand the fans want to see the players fight until the end. Of course we lost 3-0, it’s not an easy result, we are in a very dangerous situation, I understand. Fulham's defensive issues showed themselves once more as Manchester United eased to a 3-0 victory at Craven Cottage. They failed to track Paul Pogba's run, who was played onside by Joe Bryan, with the United man smashing the ball past Sergio Rico at his near post. Pogba stepped up and smashed it home to grab his second - here's how we rated the side. Left too much space behind him which was exploited to deadly effect by Martial. Couldn't get anywhere near Martial in the first half. Moved into central defence in the second half but had a tough time of it. Didn't push out with the rest of the defence and played Pogba onside for the goal. Wasn't able to get any real crosses in and had a tough game defensively. Didn't track the run of Pogba for the opening goal. Battled in midfield but found the gap between the midfielders and forwards was too large. Got back and mucked in defensively and looked to get Fulham going forward but had very little success. Faded in the second half and didn't do too much. Struggled to deal with Martial and didn't have the best of impacts on the game after coming on. It might have been different had Luciano Vietto scored with barely a minute on the clock, this after the lively Andre Schurrle had got in behind the United defence and sent a pinpoint cross to him at the back post. Instead, Vietto steered the ball wide and United continue to benefit from the good luck they have experienced under Ole Gunnar Solskjaer’s pixie-like management. Solskjaer was forced to leave out Victor Lindelof as a precaution even though he admitted he was “not really a concern” for next week, leaving a sense that he was looking for an excuse for some rest and rotation ahead of the visit of Paris Saint-Germain to Old Trafford next Tuesday. His second-choice centre-back pairing of Phil Jones and Chris Smalling looked uncertain of themselves early on, with Vietto, Schurrle and Ryan Babel all looking sharp. Fulham had already shown a few signs of being ready to commit the defensive hara-kiri which has sabotaged their season so far. Maxime Le Marchand, playing at centre half, had the first moment of idiocy at the back, attempting to dribble out from a risky position only to be dispossessed in front of the box, almost allowing Paul Pogba to score. As it turned out, Pogba would not have to wait too much longer to add to his goal haul. Anthony Martial set him away to the left of the goal and, from a tight angle, he guided his finish past the flapping right arm of Fulham keeper Sergio Rico. Replays showed that left-back Joe Bryan had been playing Pogba onside, with Fulham’s defence impossibly soft. Ten minutes later, it was Martial’s turn to horribly expose the Fulham back four. With Denis Odoi playing a ludicrously high position at right-back, a simple pass from Phil Jones allowed Martial to tear away down his flank. Killing Le Marchand with a clever jink, Martial was never going to be caught. He proceeded to fire a beautiful curled shot past Rico, the ball swerving on the icy wind blowing off the Thames and slamming into the top right corner. If Solskjaer saw this game as little more than a preface to the clash with PSG, it will at least have allowed United to sharpen up their attacking instincts. Though Marcus Rashford and Jesse Lingard – both on the bench against Fulham – are expected to start in place of Romelu Lukaku and Juan Mata on Tuesday, Martial had an excellent game and Pogba, United’s attacking fulcrum in the midfield under Solskjaer, was at his all-action best. United’s performance was far from perfect, especially during a somewhat disjointed second half, but Pogba still added another goal after a soft penalty for Juan Mata and United could have scored more. For Ranieri, meanwhile, the honeymoon period seems to be over after barely three months in charge. His decision to substitute Schurrle for Cyrus Christie early in the second half was met with boos, followed by chants of “You don’t know what you’re doing” and “Ryan Sessegnon, he’s one of our own”. Much has been made of Sessegnon’s lack of game time under Ranieri, though he has been far less effective this season than he was in the Championship. Still, his omission is unpopular among Fulham fans and Ranieri may want to consider reintegrating him into the starting line-up, though in fairness the ‘Tinkerman’ was seeking a change of team shape more than a straight swap when he brought Schurrle off. Fulham have found their fortunes marginally improved under Ranieri, in contrast to the dark days at the end of Slavisa Jokanovic’s reign when they lost six games in a row in the Premier League. He now has 12 points from his first 14 league games in charge, compared to five from their first 12 under Jokanovic. That is not the sort of points-to-game ratio which saves a team from relegation, however, and Ranieri must know that time is running out for his side. It may have been optimistic to expect them to upset United, but there are games coming up against West Ham and Southampton which they absolutely must win lest they prove the worst pessimists justified. If this was Manchester United with half of the first team rested, it is scarcely imaginable what United at full strength would have done to Fulham here this afternoon. This 3-0 win at Craven Cottage, with the second half played at walking pace, was still one of the most comprehensive, one-sided, complete victories that you will see in the Premier League all season. Aside from one early miss from Luciano Vietto it was all one-way traffic and there was never the slightest feeling that there might be any result other than an away win. In that sense it could never have been a good game, because they always need competitive tension and suspense. It was more impressive as a performance from Manchester United, especially from Paul Pogba, who scored twice, and Anthony Martial, who scored the other. But Ole Gunnar Solskjaer did not even need to field his strongest team to get this thumping easy win. Marcus Rashford, Jesse Lingard, Ashley Young and Eric Bailly were all rested, to keep them fresh for Paris Saint Germain on Tuesday night, which will be a very different prospect indeed. It is difficult to disagree with that decision given what we saw here, and the chasmic gulf between the two teams. Who knows what the score would have been here had Solskjaer pushed in all of his chips. As good as Pogba and Martial were, the most striking part of today was just how bad Fulham were. Because they looked further away than ever from a team that is hoping to stay up. The first expectation of a side second from bottom is that they will do the basics right and be hard to beat. That after all is why they replaced Slavisa Jokanovic with Claudio Ranieri back in November. But this Fulham team in fact do the complete opposite: they get the basics wrong and are very obviously easy to beat. Yes if Luciano Vietto had scored from their first minute attack it would have been a different story, but he missed. And everything after told the story of why Fulham are almost certainly going down. They just do not want to defend properly. That was clear when Maxime Le Marchand - for whom Fulham will hope that they kept the receipt - tried to play the ball out from the back early on and immediately ran into trouble. While Pogba’s finish to give United the lead was good, the goal was ushered into being by some of the worst defending you will see anywhere this season, an almost coordinated series of mistakes. Le Marchand overplayed and lost possession, Jean Michael Seri lunged in, Joe Bryam played Pogba onside, Sergio Rico let the ball in at his near post. Even the second goal, while obviously individually excellent from Anthony Martial, was barely ever challenged by the players whose job it is to do just that. Martial got the ball 10 yards inside his own half as he started to motor forward, too fast for Denis Odoi. Le Marchand was in position to make the tackle but all he did was diffidently hang out a leg, like a man dipping his toe in the sea to find out how cold it was. No wonder that Martial sped straight past him and put the ball past Rico. It all made Ranier’s pre-match call for “soldiers who fight to the end” look ludicrously optimistic. What they needed was unity. What they got was discord. Ranieri has made few friends here with his benching of Tom Cairney and Ryan Sessegnon, and when he took off Andre Schurrle not for either of those two but for Cyrus Christie, the fans started to boo. That change allowed Fulham to go to a back five, but it did not matter how many defenders they had on the pitch when they were all playing this badly. The third goal came when Calum Chambers was brushed away by Pogba, charging forward on the break. When the ball got into the box Le Marchand, looking as lost as ever, tripped Juan Mata and then Pogba scored the penalty. That was pretty much it, although Babel missed a close chance just before he was taken off. Ranieri finally brought on Cairney and Sessegnon at the end, but it was far too late to make a difference. It may already be too late for Fulham too. Manchester United made light work of relegation-threatened Fulham at Craven Cottage this afternoon, cruising to a 3-0 victory which took them - for a few hours at least - into the top four of the Premier League. While much will rightly be made of United's resurgence under Ole Gunnar Solskjaer, the inept display from Fulham suggests they are destined for the drop after just one season back in the top flight. Fulham didn't exactly roll over for United but their inept display was derided by Sky Sports summariser Gary Neville who was desperate for "a tackle, a shot, anything" to try and wake up the home fans who were left frustrated with what they saw. One man who bore the brunt of the criticism was Ryan Babel. The well-travelled striker was a surprise January signing by Claudio Ranieri but as history tells us, we can't always question the motives of the man who guided Leicester to the Premier League. Babel was always going to be in for a rough afternoon as a former Liverpool player and his every touch was jeered by the travelling United fans who remember his connection with the Anfield club. He made himself an even more visible target by dying his hair red then somehow missed the target from inches out and was immediately substituted. It was a move which proved the most popular of the afternoon as the home fans applauded his exit. Social media wasted no time in laying into Babel who must have been more surprised than anyone that he was playing in the Premier League at this stage in his career. Babel had 50 touches, two shots and none on target. Fulham have launched a half and half black and white shirt to mark their 140 year anniversary and it is just lovely. The Fulham anniversary shirt black and white shirt reminds us a bit of The 84 shirt we produced with Inaria. Made by Adidas. The shirt is a simple black and white half and half shirt with a special 140 year crest. Only a limited number of 1,879 shirts have been produced, each individually numbered and certificated to mark their exclusivity. The shirt was launched with members of Fulham FC Foundation’s programmes such as the Fulham Badgers and Walking Football teams. They were joined by members of Fulham FC’s Men’s, Women’s and Academy sides. You can grab the Fulham 140th anniversary kit for £65 at fulhamfc.com. We started very well. We created two great chances to score a goal but suddenly Pogba scored a goal and I think 'okay, stay calm and we can continue to play and find the solution to draw the match'. That's the difference, when you play against champions you must stay calm, don't lose composure, that's the real problem. No I understand the fans, they want always to see their players fight until the end. We lost 3-0, it's not an easy result, we are very dangerous situation and they can undertand. Dangerous situation, see anything to suggest you'll get out of it? What I can say, when you play against Manchester United, City, Liverpool, you can lose but it's important the experience. Understand the fan's frustrations with not seeing Sessegnon play? He's working but it's the first time he played in the Premier League, it's not possible to play at the high level all the season. Just a little recovery for him. I tried to help my players to do less mistakes, that's it. He's not in good, good form. For this reason I put him not from the beginning but in the match. Tottenham could soar next season if they welcome a new capable forward to help cover Harry Kane and the ideal solution is surely Fulham attacker Aleksandar Mitrovic. The powerful 24-year-old Fulham forward has been in excellent form all season despite his side’s struggles in the Premier League and is exactly what Mauricio Pochettino’s side could do with. Mitrovic has scored 10 goals in 26 league outings this season, also assisting two, and has proven that he is worthy of playing in England’s top-flight. The forward is also at an age where he will surely keep improving and could be willing to take his chances competing with Kane for playing time, in order to play for a side like Spurs that compete at the top-end of the Premier League. Spurs have always tended to fall a little short in recent times when it comes to trophies, with one of their issues being that they don’t have a consistent top-level forward to help them over the line when Kane is unavailable. In fact while Spurs have Fernando Llorente on their books, he has never looked able to replicate Kane’s form in front of goals when asked to cover for the player’s absence. However while Mitrovic isn’t on Kane’s level, at least just yet, he is more than capable of making Kane having a spell on the sidelines irrelevant as the Premier League powerhouse thrives being relied upon, just look at how he is doing at Fulham currently. Also as former Spurs midfielder Jamie Redknapp said on Sky Sports Premier League (Saturday February 9th, 12:04) ahead of Fulham taking on Manchester United, Mitrovic is a defender’s worst nightmare. “He’s your worst nightmare if you’re a defender as he’s always looking to have a fight with you, he’s physically strong and he’s very good in the air,” said the pundit. “Every time I watch him, he bullies defenders and we saw him against Tottenham last time he is a real handful and he needs a little help, he needs Ryan Babel to help him. “I think whatever happens whether Fulham go down or not, he is still a Premier League player next year, someone will take him because of the way he plays. When you consider that Redknapp is probably right to suggest that Mitrovic could be on the move in the summer, especially if Fulham are relegated, it makes sense for Spurs to sneak in and sign him as he could help them soar even further than before. 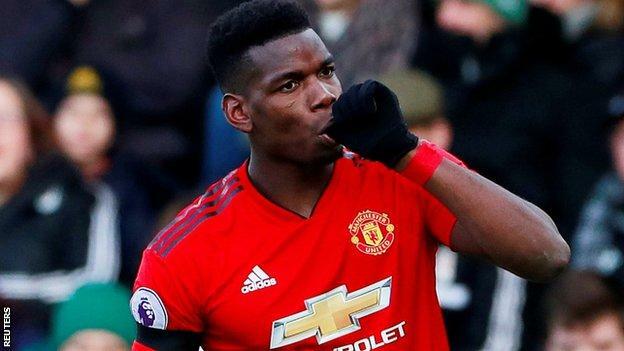 Manchester United lifted themselves into the top four of the Premier League with a 3-0 win over Fulham on Saturday afternoon. A Paul Pogba double and a brilliant solo effort from Anthony Martial saw Ole Gunnar Solskjaer's team sweep aside the relegation-threatened Cottagers. United have now won eight of their nine league games under the Norwegian coach, who took over on a temporary basis after Jose Mourinho was sacked in December. For Fulham though, things are going from bad to worse. They remain second-bottom in the table and are seven points from safety after playing a game more than their relegation rivals. At full-time, fans inside Craven Cottage turned on Claudio Ranieri and his players who now have a real fight on their hands to secure safety. Going into the fixture, not many gave the hosts any real chance of beating Solskjaer's in-form Man United side. And that's how it ultimately panned out. It wasn't a really embarrassing result - but rather a defeat that many saw coming. But there was a moment during the game that one Fulham player will be particularly eager to forget. With just under 15 minutes to play, the ball dropped to Ryan Babel, who was standing less than a yard from goal. Rather than simply tapping into an unguarded net, the January signing fluffed his lines and poked the ball on to the post, before it ricocheted back off his leg and behind for a goal kick. To make matters worse, missing from a few inches out was Babel's last involvement and he was subbed off just seconds later. Although the change was likely planned before he missed, the forward's confidence will probably be knocked by such a poor miss. Still, even if he had scored it would have made little difference to the final result, as Fulham were 3-0 down at the time. In this episode, we shared our ”initial reactions” to Fulham’s 3-0 loss to Manchester United. Co-host Emilio Di Nello was at the match, and he shared his view. We both vented our frustations with this pathetic performance once again by Fulham. We also discussed if it it time to sack Claudio Ranieri. Claudio Ranieri admits Fulham lost their composure as Manchester United ran out comfortable 3-0 winners at Craven Cottage on Saturday. Goals from Paul Pogba (2) and Anthony Martial mean Ranieri's Fulham have won just two of their last 13 Premier League games, with their top-flight status in serious doubt. He told Sky Sports: "I was so happy the first 10 minutes, two great chances, but after we concede that goal, they break the lines, always asking for it behind the defensive line. "We had to stay calm, we lost our composure, we concede the second goal on the counter-attack. In transition, that is not possible against teams like Manchester United." Ranieri was jeered for taking off Andre Schurrle in the second half for Cyrus Christie, with cries of "you don't know what you're doing" from the home fans, but the manager defended his decision after the game. "I changed it because I wanted to put Babel behind the two strikers and put the full-backs around their defensive line. We created some good crosses, but didn't have a good chance." 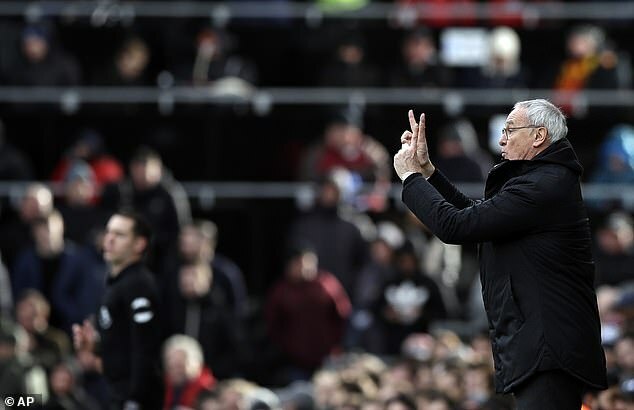 Ranieri reiterated the need for Fulham to fight in the final 12 games of the season, and was pleased with the fact his side were pushing for a goal even at 3-0 down. "We have to work hard, it's important to maintain the hope to do our best. I watch my team down 3-0 but they still wanted to score which is a good thing. "We have to fight. We fight, but against champions the fight is not the only thing you have to do." Claudio Ranieri has attempted to offer yet more explanations for Ryan Sessegnon's absence from the Fulham first team - this time citing his fitness and form. The 18-year-old was named on the bench once again for the 3-0 defeat to Manchester United at Craven Cottage and came on the final ten minute with his side already well beaten on the pitch. It was a selection that once again baffled the Fulham fans, with six of his last eight appearances under Ranieri coming as a substitute as the manager selected the likes of Andre Schurrle and Luciano Vietto ahead of the youngster once again. Sessegnon's situation is just one of the things that has led large sections of the Fulham support to lose faith with the Italian, and after citing that the 18-year-old needed to get 'nastier', the manager has now said that he's not at his best fitness nor his best form. Speaking after the defeat at United, Ranieri said: "Yes I know, but Ryan is a good player but in this moment is not at the best of his fitness and form. For this reason I played with Joe Bryan. "He's working but it's the first time he played in the Premier League, it's not possible to play at the high level all the season. Just a little recovery for him. "He's not in good, good form. For this reason I put him not from the beginning but in the match. "I consider him one important player for us, for now and the future." Why even bother going three at the back when you’re down 2-0? Why even bother putting Denis Odoi at fullback when we all know he wasn’t good enough in that position at Championship level? Especially after he turned Ashley Young into Roberto Carlos back at Old Trafford. And he’s 30 years old, so he ain’t getting better anytime soon. Why even bother sitting out Tom Cairney when everyone knows Luciano Vietto has no business in a starting XI for a top five league European team? Why not even try to give Ryan Sessegnon a go when we all know Manchester United’s weakness is in their defense? To keep it simple, you know you should be sacked immediately when everyone living in a basement can pick a squad better than you. That’s where Claudio Ranieri is at the moment and has been ever since the FA Cup defeat to Oldham. But even that doesn’t cure all of Fulham’s ills. Everyone at the club swore by never wanting three managers in a season ever again, regardless of how said season turns out. Fulham essentially have no choice but to do it now if they ever want to maintain sanity. They either should get relegated while trying their best and build the senior team from there or get relegated on a complete whimper and become a consistent mid-table Championship team for years to come. The latter is easily where they are now and all of the blame falls onto the Khans for ever allowing this to happen. I don’t think the players aren’t trying though, as individuals. Fulham really could have had the lead if Vietto was able to make the better decision by blasting his right footed shot home instead of placing it. This came from some fantastic buildup play by Ryan Babel and André Schürrle that set up his cross from inside the penalty area. Then again, Vietto’s only had one goal in almost 10 months so what should we expect. Later, Joe Bryan put in a ball that towards Aleksander Mitrovic who out-muscled the living tar out of Chris Smalling to try to head it home but instead went way wide. From there, Schürrle gathered the scraps only for him to lean back and shoot it over the bar. Then again, we all know Schürrle doesn’t generate quality chances at all so of course his stuff doesn’t work all the time. Those two attacking sequences all happened within the first three minutes of the game. Generally, the home crowd would be making that special noise that demands everyone at the football ground to be louder throughout the remainder of the contest. Instead, there was only a light-hearted amount of encouragement because we all know the inevitable was to come. We just didn’t know how it was to come. First, Paul Pogba reached double digits in league goals for the first time in his career because Bryan kept him onside and Sergio Rico has struggled mightily to shake off what made him so bad at Sevilla in 2017/18 thanks to his lack of cover of the near post. Romelu Lukaku was making a hard run into the six yard box, but Rico still needed saving the ball to be his first priority. Next, Anthony Martial turned into 2007 Lionel Messi because that left half space that is occupied by Odoi and Maxime Le Marchand was making repetitive replies that aren't funny! to fail as soon as the starting XI was announced. Surely enough, none of them put in a good tackle and the Frenchman was able to put it past Rico from the penalty area with ease. United really could have made it 3-0 earlier if Phil Jones’ attempt was just a foot or two below the crossbar. Calum Chambers gave it a go before half time only for David De Gea to save it comfortably in the end. That certainly didn’t stop the Fulham supporters from booing their side off the field at halftime once again. Surely enough, the third goal did come thanks to a Lukaku burst that led to a pass to Juan Mata inside the penalty area. Because the defense wasn’t settled at all, Mata was fouled by Le Marchand and referee Paul Tierney had no choice but to give a penalty. Surely enough, Pogba converted as all world class players do and the rest was history. And with Fulham being down 3-0, Claudio Ranieri couldn’t help being himself and play five at the back by bringing on Cyrus Christie. Surely enough, Le Marchand had another mistake in a very bad afternoon where he headed the ball towards Alexis Sanchez that put him one-on-one with Rico. Thank goodness the Spaniard was able to save his teammates’ face with his save on Sanchez. Along with that, Babel did his best to put himself in prime goal scoring range only for him to hit the post from inches away and then put it out of play. And that was that. I don’t even know how the support can even get excited again after this upcoming two week break. It’s so obvious a managerial change has to happen, but that will lead us to having Scott Parker in charge because who on Earth wants to be the third manager of a football club that is about to get relegated. Please do your best to force the club to sack Tony Khan peacefully. I just don’t have any positivity to give out anymore until next season. Everything about this club is miserable and dyer and it is shocking how it ever even got to this point. Barnsley extended their unbeaten league run to 11 games as Cauley Woodrow netted a double in a 4-1 victory over struggling Gillingham. Kieffer Moore hit his 18th goal of the season after just 15 seconds, slotting past Tomas Holy from six yards after the Gillingham goalkeeper had parried Cameron McGeehan's shot. Strike partner Woodrow wasted a golden chance extend the lead when he headed at Holy two minutes later before Alex Mowatt fired against the bar. However, the former Fulham forward made amends for his earlier miss when he looped a 45th-minute header over Holy from Mamadou Thiam's deep cross. Woodrow then scored his 11th of the season after 71 minutes, shooting low from an acute angle after latching onto Liam Lindsay's header. Gillingham, who fell into the relegation zone following their ninth home league defeat from 16 games, scored a consolation nine minutes from time when Elliott List fired through a crowded box from 18 yards. But Jacob Brown completed the scoring 11 minutes into stoppage time by smashing in off the underside of the bar. The Tykes' win was overshadowed by a nasty injury to Moore, who was carried off late on following an aerial collision with Gills captain Gabriel Zakuani. Shahid Khan has discussed how Fulham could have sold players for over £100million this January but turned down all approaches to give the side a chance of staying in the Premier League. An unnamed Chinese club reportedly made a £50m move for top scorer Aleksandar Mitrovic in the January transfer window but it was very quiet on the outgoing front, with only Aboubakar Kamara and Stefan Johansen leaving the club. It's well known that Fulham made £100m worth of signings in the summer, bringing in 12 new faces, but despite that they currently sit in the relegation zone in the Premier League having won just four games at time of writing. In his pre-Manchester United programme notes, Khan has revealed how Fulham could have conceded and consigned themselves to relegation, but instead turned down the advancements in order to try and keep the side in the Premier League. He said: "We could have conceded and been sellers in January. To that point, after investing more than £100million in the summer in a clear mission to compete, we stayed loyal to our commitment by turning down more than £100m in January to sell players to clubs in Europe and China. "Why? Because we wanted to give this squad very opportunity to compete, to show the fight I know is inside them and to be the one we'll remember making a dramatic and successful late run to safety." Fulham made three new signings in January, bringing in Ryan Babel, Harvard Nordtveit and Lazar Markovic on deals that will all expire at the end of the season. Fans were disappointed that more business wasn't done and that key positions, such as central defence, weren't addressed by the club's recruitment department, but Khan has addressed those concerns in his programme notes. He has said that all three came with Claudio Ranieri's approval, something that was a problem under former boss Slavisa Jokanovic, and that Fulham would have done more business had the 'dynamics' of the transfer window allowed it. He added: "In that spirit, we made three investments in January in Ryan Babel, Harvard Nordtveit and Lazar Markovic, all three coming with Claudio's endorsement. "Our spend in January significantly exceeded the revenue in from loaning out Aboubakar Kamara and Stefan Johansen, and we would have been open for more business had the dynamics of the January transfer window been more favourable. "The overall lack of transfer activity across all leagues, however, speaks to the nature of the January period, and I must again emphasis that we have a talented unit - as evidence by the great interest in purchasing a number of our top contributors - that can and should be capable of making a run, especially with three new players with Premier League experience recently joining the club." Feeble Fulham look making repetitive replies that aren't funny! Being beaten by a Manchester United side who are experiencing a renaissance under Ole Gunnar Solskjaer can’t be considered a disgrace. But the lack of a clear strategy to trouble the visitors – or a plan to redeem themselves after the concession of a couple of soft goals in the first half – should deeply worry both the Fulham hierarchy and Claudio Ranieri. After all, the Italian was brought in to replace Slavisa Jokanovic on the understanding that he would be able to fortify Fulham’s leaky defence and the improvement has been marginal at past. The boos that greeted the second half replacement of Andre Schurrle with Cyrus Christie summed up just how out of the touch the Fulham manager is with the Craven Cottage faithful. Ranieri thought the home fans were lampooning his decision to introduce a full-back for Schurrle, who had struggled with the flu in the build up to this fixture, or switch to 5-3-2 when the Whites were already 2-0 down. In actual fact, the Fulham fans were disappointed that Ryan Sessegnon and Tom Cairney, consigned to the bench again with the need for a win almost reaching desperation point, weren’t summoned forward to add a spark to what had become a limp display. Omitting Fulham’s two most consistent performers during their promotion-winning season wasn’t the only way in which Ranieri’s selection was muddled. He went with a five-man defence at Crystal Palace last week when Roy Hodgson’s side were likely to sit in during a tense contest, but opted for a flat back four this afternoon when Solskjaer’s side were always certain to come at the league’s worst defence with all guns blazing. Denis Odoi, shifted from centre back to right back here after Cyrus Christie had conceded a penalty at Selhurst Park last weekend, struggled in the same position at Old Trafford earlier in the season. He was like a fish out of water against the pace and power of Anthony Martial. The French winger skipped away from him before creating the opening goal with a clever pass for Paul Pogba, who squeezed his finish between Sergio Rico and his near post. The Spanish goalkeeper perhaps should have done better – but the contest was effectively over after fourteen minutes. Martial then displayed the blistering pace and mesmerising skill that prompted United to pay Monaco a rumoured £36m for his services back in 2015. The winger received possession from Phil Jones and sprinted fully forty yards before curling an unstoppable finish beyond Rico, darting away from both Odoi and the unfortunate Maxime Le Marchand, to double United’s lead. At that point, it seemed as if the visitors could have as many goals as they wanted. It was something of surprise that they only added one more, which came when Pogba clinically converted a penalty after Paul Tierney pointed to the spot when Juan Mata tumbled after Le Marchand’s challenge twenty minutes into the second half. Fulham’s defensive disarray is old news. Without Alfie Mawson due to a freak injury, the Whites are without a genuine top flight centre back – and it shows. There seems to be a brittleness to their spirit, too, these days that suggests they are beaten once the opposition gets in front. After a bright start, Ranieri’s men showed very little in the second half. The closest they came to a semblance of fight was when Aleksandar Mitrovic squared up to David de Gea in stoppage time after the pair challenged each over for a loose ball. Time is running out for Fulham and Ranieri. The Italian manager hasn’t been able to make a decent fist of this survival mission – and the placid Craven Cottage crowd appears to have turned against him. The Whites actually started this game at quite a tempo and almost caught United cold at the very start but Luciano Vietto scuffed a simple finish at the back post when he had been sent clear by a raking crossfield ball from Schurrle. A nightmare run of fixtures and a ten point gap to Cardiff – after the Bluebirds’ emotional win at Southampton this afternoon – suggests that a side who achieved promotion with such a swagger last season will soon leave the top flight with barely a whimper. It is a terrible shame and one hell of a missed opportunity. FULHAM (4-2-3-1): Rico; Odoi, Bryan (R. Sessegnon 81), Le Marchand, Ream; Chambers, Seri; Schurrle (Christie 53), Babel (Cairney 77), Vietto; Mitrovic. Subs (not used): Fabri, Anguissa, Ayite, Kebano. MANCHESTER UNITED (4-3-3): de Gea; Dalot, Shaw, Smalling, Jones; Matic, Herrera (Bailly 85), Pogba (McTominay 74); Mata, Martial (Sanchez 70), Lukaku. Subs (not used): Romero, Young, Lingard, Rashford. Fulham boss Claudio Ranieri accused his team of losing their composure as their hopes of surviving in the Premier League are now dangling by a thread. After their 3-0 defeat by Manchester United, Ranieri's side have lost five of their last six games and are seven points from safety. The Italian's decision to ostracise teenager Ryan Sessegnon and captain Tom Cairney, both of whom started on the bench on Saturday, is doing little to endear him to the Cottage locals. The manager was booed from the field, having been taunted by chants of 'You don't know what you are doing' when he brought on Cyrus Christie for Andre Schurrle in the 53rd minute. Ranieri had asked his players to be 'soldiers' this week but after a bright start, Fulham meekly surrendered. He added: 'We started very well and created two great chances. Then Paul Pogba scored and I was thinking "Stay calm and we find solutions."